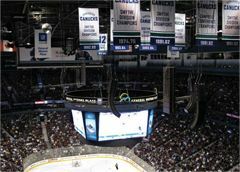 VANCOUVER, BC, CANADA—In 2007, the new owners of General Motors Place, Canucks Sports and Entertainment, asked consultant John Riley to take a look at the audio and other systems in the 18,000-seat venue. Riley, who became chief audio technician for Canucks Sports and Entertainment in early 2008, found that there was more wrong with the infrastructure than imagined. The time had come for a new system, for NHL Canucks hockey fans, concert-goers, and for the upcoming 2010 Winter Olympics. GM Place, which temporarily will be renamed Canada Hockey Place for the Games, will be the main venue for hockey competitions. The L-Acoustics speaker system, designed by Vaino Gennaro, director of live sound products, Sennheiser Canada, features line-source arrays consisting of 78 dV-DOSC speakers, 12 dV-SUBs, 16 SB28 subs, 24 LA8 DSP amps, and six ARCS speakers. Other components include an Optocore distributed audio and control system, Soundcraft Vi6 mixing console/ digital control surface, multinode Riedel Artist digital matrix intercom system, and Lectrosonics digital hybrid wireless microphone/IFB system. RMPS had the month of August before entering the building, he said. “John had the vision and I followed his lead, but sewing it all together and making sure it functioned was up to us. We made the game deadline and that was huge and satisfying.